LIVE TEXTING will enhance any event with crowd interaction! You can host your own Americal Idol-like event or a Battle of the Bands with LIVE TEXT Voting! The results are seen in real-time! This can be good for Beauty Pageants, Car Shows, and other events. You can even get two or more people to dual for the most votes. The person who gets the least amount of votes in a certain amount of time has to sing a Karaoke Song, get in the Dunk Tank, donate a certain amount of money, or whatever you decide. LIVE TEXT can be set-up to accept multiple votes from the same person or to only allow one vote per participant. You can host LIVE TEXT Games where the first person to text the correct answer wins! Trivia and Name-That-Tune are often big hits with this feature. You can also do raffles where each guest writes their name and cell phone number on a raffle card. The guest who receives a "You're A Winner!" message from the operator wins! If you have a concert, wedding reception, or another event, there will never be a dull moment or any downtime! Your guests can send messages to the big screen. Don't worry! These messages are filtered for content. Your guests can send a LIVE TEXT Shout Out to their friends, the bride and groom, or anyone you want them to. Imagine guests that were unable to make it to your celebration (i.e. 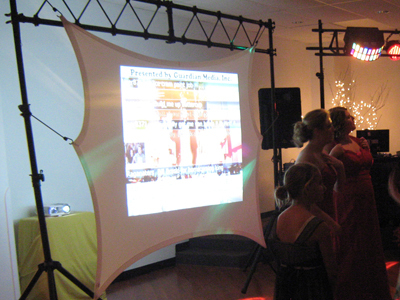 wedding reception) being able to text a message to the Big Screen at the time you specify. Friends and realities can let you know they're thinking of you, even if they couldn't make it. The music is sure to be right when your guests can instantly request a song from their cell phones. Music is an intrical part of any event! Keeping an intimate connection with your guests and flowing with their often spontaneous musical preferences will ensure your events success! You can even use LIVE TEXTING for research or teaching. We can set-up in your classroom or research facility for instant student or participant interaction and polling. You can keep text responses anonymous for a level of interaction that can be much less intimidating than for a student or participant to raise their hand. This will increase the potential for honest answers and feedback. We can set up an interactive screen at your event or even at the mall to poll live results. We can help you create LIVE Texting Campaigns to promote your product or cause. LIVE Text can give you instant leads and potential clientele. Every time a person sends a text to the provided number, their cell phone address is recorded. This can be used for follow-up cals or mass text message campaigns. There are several ways to get potential clients to interact. One easy way is to have a raffle. Each participant will write their name and cell phone number on a raffle ticket or custom card. When you decide to pull a winning ticket or card, the winner will get a text from you or the operator that says "You're a Winner!" There are many other exciting things you can do with LIVE TEXTING.